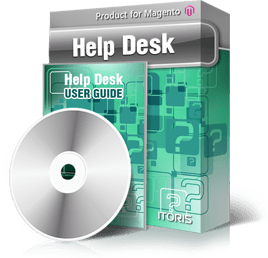 The Help Desk module is an advanced ticket support system, feature rich and flexible to completely meet your needs. Departments (optional). Create as many departments as you need, e.g. Sales department, Support department, Technical department, etc. Each department will receive its own specific tickets. Operators (optional). Create as many operators as you need and link them to backend users. Operator is a backend user. Assign operators to departments. Tickets. Customers has a special area on their account dashbord to submit new and see replies on existing tickets. Ticket can be assigned to department and/or operator. Customer can link an order to the ticket or ask a general question. Contact Form. Can be converted into the ticket submission form. If enabled all requests submitted though the contact form will be posted into the tickets database. In addition you can write your hours of operation on the contact form. Ticket Management. If operator selected during the ticket creation the backend user receives an email notification. If department selected the default operator of the department receives an email confirmation. If no department or operator selected the "main" admin receives a notification on the system email address. Ticket can be re-assigned to another department or operator. In this case the operator receives a notification. Ticket Statuses. Once created ticket gets the "pending" status. Once replied by operator it gets the "replied" status. If customer replies on the reply the ticket gets the "updated" status. If admin/operator created a new ticket from backend the ticket gets the "new" status. Every status change triggers a email notification to the related party. Ticket Statistics. The are detailed stats available for departments and operators - the number of all tickets assigned, the # of pending and replied tickets. All stats are available for each customer as well. Each ticket has the creation and the update dates. Ticket Lists. There are the lists of all and pending tickets available, and the list of "my tickets" as well, i.e. assigned to the currently logged in operator. All lists are filterable and sortable. Email to Ticket Conversion. The extension has the possibility to convert emails into tickets. Set up an email address and login credentials and Help Desk will pick up emails directly from the email account. All new emails will be converted into pending tickets. All customer replies by email will be converted into replies of existing tickets. Email Templates. All emails sent through the help desk system can be edited via the transactional emails. Operators Signatures. Each operator can have the default reply block with signature in it.